They Get Me So Mad – Biomedical Works! They get me so mad! Who are “they”, you might ask? Well “they” are those parents that lament because their child with autism isn’t doing as well as Matthew, but when I explain to them that their child can improve too, by simply doing biomedical interventions, they are full of excuses why I’m wrong. If you aren’t willing to listen to me, THEN DON’T ASK! Yes, I’m yelling. Today I ran into a mom I’ve met only briefly before. She has a 5 year old son with autism. He appears to be non-verbal, very thin, eats a limited diet, and isn’t doing well in school. She asked me how my son could be doing so well and I explained that we use Biomedical interventions and they are what rescued my son. She went on to ask me a lot about Matthew and I ended up telling her how he had hypotonia and was in PT at the age of 8 months, and the fact that he started OT and speech by 18 months. She insists his improvement didn’t come from biomed, but instead from getting treatment so early. 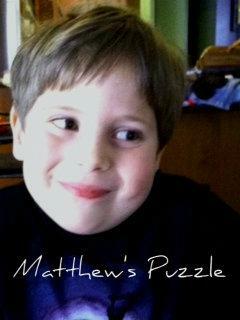 I counter with the fact that improvement didn’t come until we put Matthew on the GFCF diet. I showed her video of my son, how he can interact with other kids at school, how he has been invited to numerous birthday parties and how he has many friends. But she continues to have excuses as to why she can’t do biomedical. That her child is a picky eater – Um, red flag right there!!! He needs the diet. That she tried biomedical before and it didn’t help – come to find out she never did the diet, she simply gave him supplements. If you don’t heal the gut first, you can pump your child full of supplements but you are merely throwing them into the toilet, literally! It irritates me to no end when someone can’t even try! Do you think I’m something special? That God gave me some gift for being able to doing biomedical? Well guess what, He didn’t. All I have is determination to help my son, and I’ll do whatever is in my power to help him. So here is what I have to say to all those parents that “wish” their child was doing as well as Matthew. “Wishes” only work in fairy tales and we live in the real world. Get off your butts, get to work, and put your child on the diet. Then get out there and start researching and figure out what else your child needs. Matthew didn’t get better because we sat around “wishing”. Dang, if that was all it took there would be a lot more recovered kids out there. And if the traditional therapies such as ABA, OT and speech were all that was needed they would be telling the world that they were recovering kids. But that isn’t what we hear. What we do hear is that Biomedical Works. The kids improve and some recover. Stay Well.